When diabetes affects the retinal blood vessels, it is called diabetic retinopathy. Diabetes affects all the blood vessels in your body including those in your eyes. 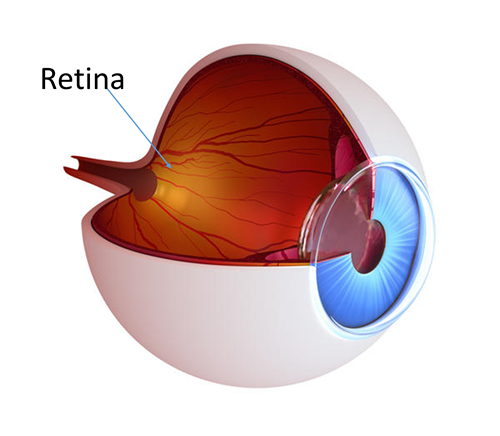 The retina is the light sensitive tissue in the back of the eye that helps us see. When diabetes affects the retinal blood vessels, it is called diabetic retinopathy. Diabetic retinopathy is the leading cause of blindness in the United States in people under the age of 60 years old. 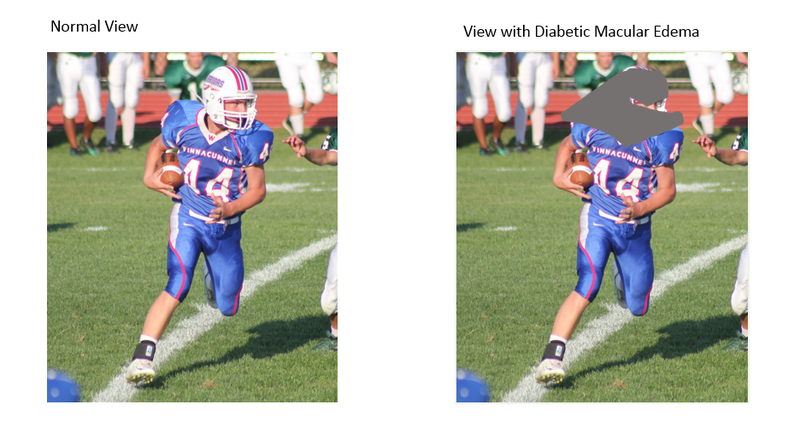 Patients with both type 1 and type 2 diabetes can develop diabetic retinopathy. The longer patients have had diabetes, the more likely it is to develop retinopathy. Pregnant women with gestational diabetes should also undergo dilated eye exams to evaluate for changes in the retina. When diabetes affects the blood vessels in the retina, it can lead to leakage of both fluid and blood. If this leakage occurs in the macula, it is called macular edema. The macula is the part of the retina that is responsible for sharp, detailed vision. This is why macular edema may cause vision loss. Sometimes, due to the damage of the retinal vessels, diabetes can also cause retinal ischemia. In retinal ischemia, areas of the retina do not get enough oxygen. As a result, the body grows new fragile blood vessels that are not as good at delivering oxygen and are more likely to bleed. This process occurs during proliferative diabetic retinopathy, an advanced stage of diabetic retinopathy. In the early stages of diabetic retinopathy, there may no symptoms. This is why it is important to have yearly dilated eye exams. If macular edema has developed, it may be associated with blurry or decreased vision . If new blood vessels have formed in the proliferative diabetic retinopathy stage, these vessels can bleed and can cause decreased vision. Diabetic retinopathy is diagnosed by a full dilated eye exam. Your ophthalmologist may do further tests such as an Optical Coherence Tomography (OCT) or a fluorescein angiogram. An OCT is a non-invasive test that allows your ophthalmologist to look at cross sections of the macula in order to detect fluid or damage to the retina. The OCT is also used to follow the progress of your diabetic retinopathy. A fluorescein angiogram is a dye test that allows for evaluation of new or leaking blood vessels. What can I do to preserve my vision? BLOOD SUGAR AND SYSTEMIC CONTROL : Clinical studies have shown that tight control of blood sugar helps slow the onset and progression of diabetic retinopathy. Diabetes is a systemic disease that affects the whole body. Therefore, controlling the diabetes through good blood sugar control and regular follow ups with your primary care doctor is very important. REGULAR DILATED EYE EXAMS : Getting regular comprehensive eye examinations is important for detecting, following and treating diabetic retinopathy. Early detection and treatment may help prevent vision loss. Diabetes can progress without any symptoms. Therefore, don’t wait for symptoms to occur. If you have recently been diagnosed with diabetes, it is important to have yearly comprehensive eye examinations. Your retina specialist will examine your eyes, determine the severity of your diabetic retinopathy, and accordingly suggest if you should have more frequent eye exams. The macula is the area of the retina that is responsible for sharp, detailed vision. A proper functioning macula is needed to perform tasks such as reading and driving. When diabetes affects the retinal vessels, it can lead to leaking of fluid and blood into the surrounding tissues. If this leakage occurs in the macula, it is called diabetic macular edema. What is the prevalence of Diabetic Macular Edema? Diabetic Macular Edema is the leading cause of blindness in the working age population in the United Sates. It affects approximately 560,000 Americans. What are the symptoms of Diabetic Macular Edema? Diabetic macular edema can cause blurry or distorted vision if it involves the center of the macula. Many patients, however, do not have any symptoms. This is why it important to have a retinal examination at least once a year. Your retina specialist will determine the severity of your diabetic macular edema and will advise you if more frequent follow up or treatment is necessary. If not treated in a timely manner, diabetic macular edema can eventually cause a permanent decline in vision. How is Diabetic Macular Edema diagnosed? Diabetic macular edema is diagnosed by a comprehensive dilated eye exam. Your retina specialist may also order tests called an Optical Coherence Tomography (OCT) and a fluorescein angiogram. An OCT is a non-invasive test that measures the thickness of the retina and allows for the detection of fluid or retinal damage. This test is useful for both establishing the presence of diabetic macular edema and for following response to treatment. A fluorescein angiogram is a test that allows your retina specialist to evaluate for leaking vessels, or for the formation of new abnormal vessels. Dye is injected into the hand or arm. This dye travels through the retinal vessels. Pictures are taken with a special camera that captures if leaking or new blood vessels are present, and how widespread it is. How is Diabetic Macular Edema Treated? If the diabetic macular edema is causing visual problems, your retina specialists will discuss various modes of treatments and will review which ones might be more suitable based on your particular situation. At Retina Consultants of Boston, we are committed to providing state of the art care and strive to help you maintain the best possible vision. 1. Mild Non-Proliferative Diabetic Retinopathy: In this very early stage of diabetic retinopathy, few microaneurysms can be found on dilated exam. Microaneurysms are outpouching along blood vessels that form due to damage of the vessel wall by diabetes. 2. Moderate Non-Proliferative Diabetic Retinopathy: As the disease progresses, there are more microaneurysms and evidence of blood vessel damage on dilated eye exam. 3. 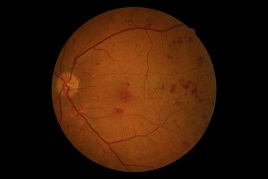 Severe Non-Proliferative Diabetic Retinopathy: As even more blood vessels get damaged, areas of the retina start experiencing decreased blood supply. This results in decreased oxygen and nutrients being delivered to those areas of the retina. As a result, the retina produces signals asking for new blood vessels to grow in order to meet the unmet demand. 4. Proliferative Diabetic Retinopathy: This is an advanced stage of diabetic retinopathy. In order to meet the retina’s demand for more oxygen and nutrients, the body starts growing new blood vessels. These new blood vessels are more fragile and are less efficient at delivering oxygen and nutrients to the retina. If these blood vessels leak or bleed, they can cause vision loss or even blindness. What are the symptoms of proliferative diabetic retinopathy? The new blood vessels in proliferative diabetic retinopathy can leak or bleed. This can lead to decrease in vision or blindness. These new blood vessels can also cause membranes . As these membranes contract, the underlying retina can be affected. Depending on what area of the retina is affected, it can result in decreased vision or even blindness. How is proliferative diabetic retinopathy diagnosed? All stages of diabetic retinopathy including proliferative diabetic retinopathy can be diagnosed by a comprehensive dilated eye exam. Your retina specialist may also get special tests such as an optical coherence tomography (OCT) or a fluorescein angiogram. The OCT allows your physician to see cross sections of the retina in order to assess if there is retinal damage from diabetes . A fluorescein angiogram is a dye test that allows your physician to evaluate for new blood vessels, leaking blood vessels, and areas of the retina that are not getting enough blood supply. Nonproliferative diabetic retinopathy generally does not require any treatment unless diabetic macular edema is present. Tight blood pressure and blood sugar control has been shown to slow the progression of diabetic retinopathy. Therefore, keeping your diabetes well controlled and keeping regular appointments with your primary care physician or endocrinologist and is very important. If you develop proliferative diabetic retinopathy, treatment is generally required. This can range from in-office procedures such as lasers or injections, to surgery. Your retinal specialist will review your treatment options with you in detail based on your unique situation.